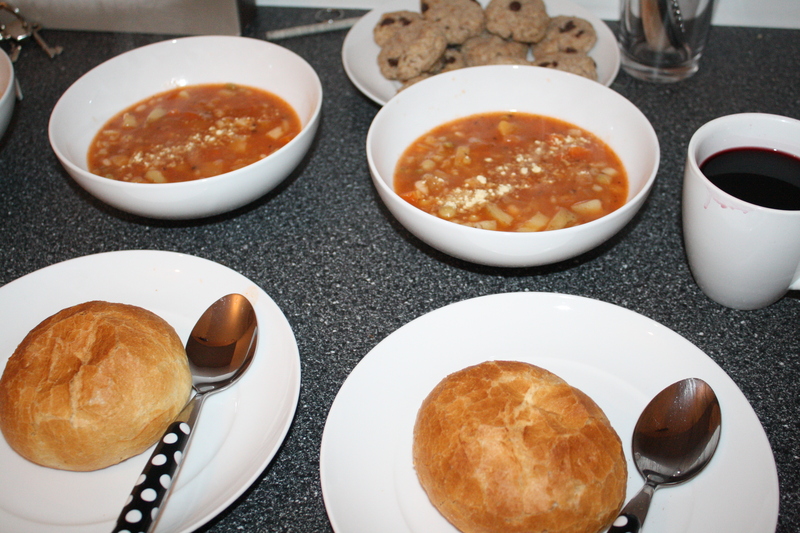 Here is my tried-and-true trusty no-fuss vegetable soup. It’s cheap. It’s easy. It’s delicious. This recipe makes 2 HUGE serves, or 4 regular serves. Sautee the leek and onion in a big pot with a little oil until translucent. Add about 1/4 cup of water (no need to be precise) and add in all the other veges. Stir around for a few minutes, then add the soup mix and leave for another few minutes. Add in about 2 cups of water, in which the stock cubes have been dissolved. Turn the heat right down, pop the lid on and let it simmer away until the veges are soft. Right at the end, stir though the tomato paste and add any extra water to get the consistency you like. Turn the heat up to a rolling boil for the last three-ish minutes. Serve immediately with a crusy roll. 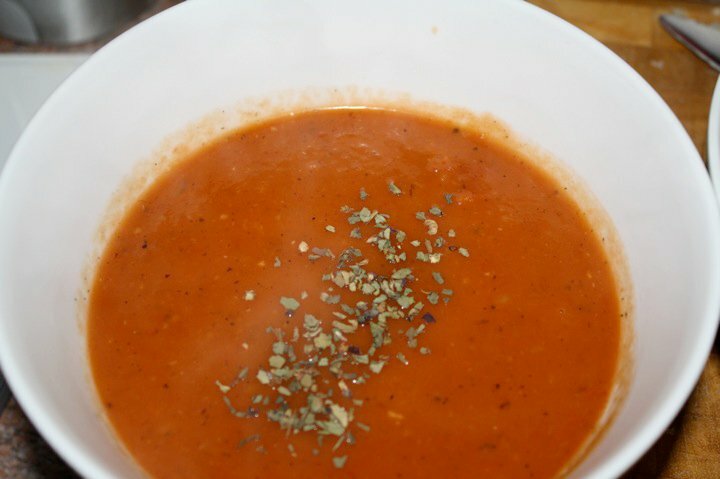 You can make this soup in advance – stop just before you put the tomato paste in. Then, when you’re ready to serve heat the soup back up, add the tomato paste and boil it in a bit. Easy. Having found Parmazano (vegan ‘parmasan’) in our local supermarket for 69p, I sprinkled a bit on the top. Given that the only time I found Parmazano in Melbourne it was around the $9.00 mark, I wouldn’t have done it. And, before you ask – yes, that is red wine in a mug. If you’re anything like me, when you make soup you really go all out and make heaps of soup! Currently I’m enjoying carrot and fennel throw-it-together with some onion and leek and potato, and double-triple-creamy-tomato (based on the double-tomato recipe from the Veganomican.) But, this isn’t about soup. It’s about pasta – and, the left-over-one serve of tomato soup when there are two people who need to eat. So, you turn it into pasta. Start by thinning out the soup (or, if the soup is frozen, start by defrosting the soup – then thinning it out). Then, cook your pasta in the thinned out soup. I like to use spirals, but you could use any kind of short pasta you like. You’ll probably need to keep adding water to the mix – but that’s okay. When the pasta is done, throw in two tablespoons of Better-Than-Cream-Cheese, or thickened coconut cream (if you don’t mind the taste), or a splash of rice-milk. Begin to stir, and start adding small amounts of plain flour – this will thicken the whole mix up. Stop adding flour when it’s at your required thickness. That’s pretty much it. Sorry I don’t have a photo, though – I was going to take a photo of the third serve which I had put aside to take for lunch, but S beat me to it! For what it’s worth, I made stir-fry last night and at the point of no return realised I hadn’t made a sauce. Rice Malt Syrup plus Soy Sauce. Trust me. One more plus: once my thesis is finally finished, I am going to dedicate a bit (read: a lot!) more time to this. It’s a resolution, baby. Last night I made the tomato soup from the Veganomicon (although I have been meaning to buy the Veganomicon for a long time I’ve never had enough room in the budget but last week S finally bullied me into it.) It was possibly the best tomato soup I have ever had in my life! I know, that’s a pretty big call, but – there you go. It’s the ‘tomato plus sun-dried tomato’ and the potato that are the real winners here. We had it with some fresh homemade crusty white bread, which was perfect! After dinner I thought I would make some carrot cup-cakes for S to take for snacks and a mini-cake for me to take with me to morning-tea today. Like many people, I’m happy to play around with recipes, and if I’m missing an ingredient I’ll happily substitute away. Most of the time, it works really well. This time, not so much. So, unfortunately the amazing carrot-cake recipe that I was planning on posting today after my magnificent triumph will not be so. But, here is my carrot-cake substitution tip: Maple Syrup and Carrot Cake are not best friends. Preheat oven to 180 C. Lightly oil deep 8 inch or 10 inch round cake pan. In a large bowl, combine flour, sugar, baking soda, salt and cocoa. Create a well in the center and add milk, oil, vinegar, and vanilla, and mix until thoroughly combined. Blend the beetroot until a smooth paste and fold gently into cake mix. Pour mix into cake pan and place in oven. Bake about 35-40 minutes. When the cake pulls away from the side of the pans and a toothpick inserted into the center comes out clean, it’s ready. Let cake cool about 10 minutes, then run a knife around the edge to loosen cake from the side. Invert the cake onto a plate and re-invert onto a cooling rack. Let the cake cool completely. To make a two layer cake, prepare 2 8 inch pans and divide evenly between the pans. With an electric mixer, cream butter until it is smooth and begins to fluff. With the mixer on a low speed, add icing sugar and fluff for another few minutes. Add vanilla, milk and food colouring (if using). Once all ingredients are well-combined, beat on high until icing is light and fluffy, 3 to 4 minutes. Add 1 to 2 teaspoons of rice milk if needed to achieve the right consistency. Use right away or cover with glad wrap to prevent drying out until ready to use. Briefly re-whip before use.